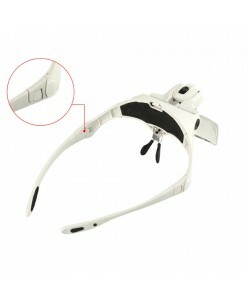 Headband Glasses Magnifier Loupe Widely used in most of fields. Features: Durable, lightweight and high quality ABS construction. 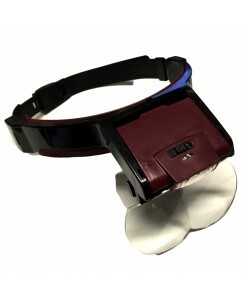 Glasses type magnifier with 2 LED lamps. 5 pairs of replaceable lens with different magnifications. Come with glasses bracket and headband for interchanging. The light angle is adjustable a.. 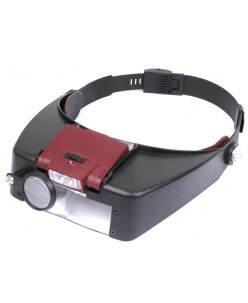 LED headband magnifier Color: Black + Red; Material: Plastic; Fixed lens magnifier: 4X-89 x 29 mm (L x W); Flip lens magnifier: 4X-89 x 29 mm (L x W); Round Single-eye magnifier: 5X -29 mm (dia); ..
CEAAA BatteryLighting: 3500K- 6500KLight: 36 LED LightsWeight: 70g. Without BatteryUsing Time: 2-4 hours (Depends on Brightness level)..
1x Magnifying Glasses Dual LED lights1x Headband5x Lens (with storage box)1x User's manual ..